The match that set the fire that ignited the red-baiting blaze in postwar Hawaii was tossed by Hawaii's Democrat-appointed Gov. Ingram Stainback. In a March speech at a Punchbowl memorial service in 1947, Stainback, who had made the dangers of Communism a favorite speech topic, issued a dramatic warning. He claimed there was a Communist plan to take over Hawaii, that Communists saw Hawaii as fertile ground for conquest, and that there were even Communists in his own Territorial government. "I shall immediately take steps to unearth these activities that are going on in this Territory," he pledged. "And where possible, expose and dismiss Territorial employees who are involved." ILWU workers during the 1949 dock strike. The visions of Communists in government and as enemies of America spread across the country. The country, already worried about Russia and Communist expansion in China and Korea, feared that foreign agents would undermine the nation. In 1947, the U.S. House Un-American Activities Committee was investigating if Hollywood was infiltrated by Communists. In the Senate, demagogue Joseph McCarthy was promising to unveil Communist conspiracies. Still, labor organizers across the country and in Hawaii were influenced by Communist teachings of social and economic justice. As the unions here grew strong, so did the backlash from the establishment "Big Five" businesses. John Reinecke, a Farrington High School teacher, and his wife Aiko, a Waialae Elementary School teacher, were fired amid school district claims that they were members of "a secret society called the Communist Party . . . and there is reasonable doubt as to their loyalty to the United States." Stainback called Reinecke the Communist master in Hawaii. The Reineckes issued a statement that while their politics were never secret, "we have constantly upheld the fundamentals of American democracy - political, economic and racial." Asked by then-Star-Bulletin political reporter A.A. Smyser if he was in fact a Communist, Reinecke replied: "It is very well known that I share a number of opinions with the Communists but that doesn't mean I am one." Meanwhile, Phil Spaulding, president of "Big Five" sugar operator C. Brewer, said, "Our own Communists are endeavoring in every way to keep production down and achieve personal success on a foundation of chaos." 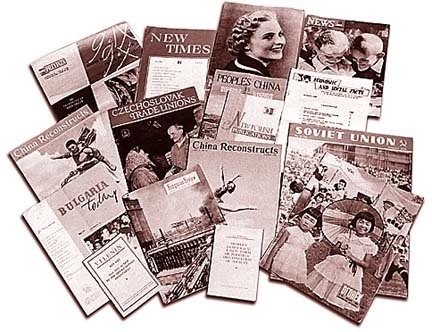 And from Ichiro Izuka, former vice president of the ILWU on Kauai, came "The Truth About Communism in Hawaii" pamphlet, which said ILWU leader Jack Hall was a Communist who distributed Communist literature. The labor movement was being led astray, Izuka warned. "The Communist Party is not interested in the workers of Hawaii as human beings or individuals," he wrote. "Its loyalty is not to Hawaii or America, but to the Soviet Union." Now the ILWU and the Communist Party were linked. Later, in 1975, Gov. John Burns, who in the 1950s was a Democratic Party organizer and delegate to Congress, would reflect that perhaps there were Communists within the union. "Every guy in the ILWU was at one time or another a member of the Communist Party of America. This is where they got their organizational information and how to organize, and how to bring groups together and how to create cells and how to make movements that are undetected by the bosses and everything else. ... I know what they were about. I said this is the only way they are going to organize," he said. And Dan Inouye, the U.S. senator who during the 1950s was Burns' political ally, noted in his autobiography that Communists were probably enrolled in the union. "No one with any sense of political reality denied that there were probably some Communists in the ILWU. ... There were those who felt that the Democrats' Party, by logical extension, was also controlled by Communists." Jack D. Kimoto, Charles K. and Eileen Fujimoto. By 1950, the FBI had gathered enough information that the House Un-American Activities Committee held hearings in April in Honolulu. Jack Hall, the ILWU regional director convicted with six others in the communism trial. Jack Kawano, Honolulu ILWU leader, was one of 70 subpoenaed. He and 38 others who refused to testify- - dubbed the "reluctant 39" -- were indicted and charged with contempt of Congress. Although those charges were eventually thrown out by the U.S. Supreme Court, the congressional committee used the information gathered to indict seven from Hawaii for violating the Smith Act, which made it illegal to "advocate and teach the necessity of overthrowing the government of the United States by force and violence." Those indictments also were fueled by Kawano's change-of-mind testimony: In Washington, D.C., he gave a congressional committee details on who belonged to the Communist Party in Hawaii. Though saying that he and Jack Hall were the only major union members in the Party, the damage had been done. 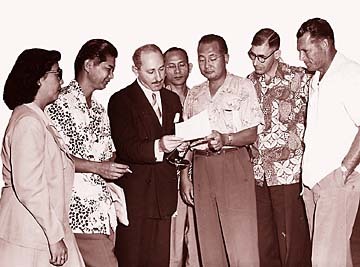 In August 1951, FBI agents arrested the seven purported Communist leaders: Hall, ILWU regional director; John Reinecke, the former teacher; Koji Ariyoshi, editor of the Honolulu Record; Jack Kimoto, Honolulu Record employee; Jim Freeman, a mechanic; Charles Fujimoto, announced chairman of the Communist Party of Hawaii; and Eileen Fujimoto, Charles' wife and an ILWU secretary. 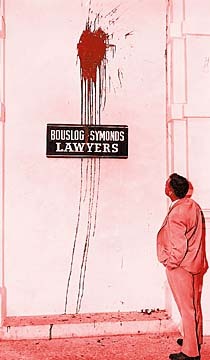 The trial lasted nearly two years and despite the ILWU's all-out defense of Hall, the seven were convicted. Appeals kept them out of jail until finally in 1958, the verdict was overturned. That Communist spectre, however, was still alive in Hawaii as the Big Five and businessman Walter Dillingham used it to fight against statehood. a December 1956 Senate subcommittee hearing here. 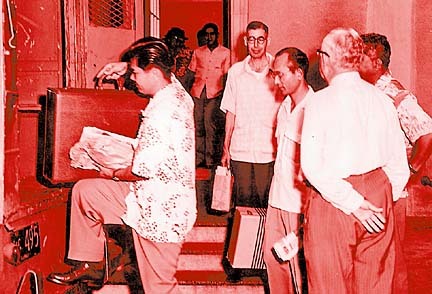 One of the most telling showdowns of the era came during a campaign rally in Aina Haina in 1954, when Democrats, including young attorney Dan Inouye, were accused by Republicans of being Communists. Inouye, the highly decorated WWII hero, rose to answer the charges. "We bitterly resent having our loyalty and patriotism questioned by cynical political hacks who lack the courage to debate the real issues of this campaign," Inouye shot back. He raised his empty right sleeve and shook it: "I gave this arm to fight Fascists. If my country wants the other one to fight Communists, it can have it." 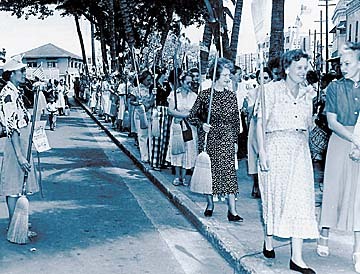 Although the forces against statehood and the Democratic Party continued to argue the danger of Hawaii's Communist-union links, the debate gained little public support. The Honolulu Star-Bulletin is counting down to year 2000 with this special series. Each installment will chronicle important eras in Hawaii's history, featuring a timeline of that particular period. Next installment: October 25.